Even though I was gone for a while, I wasn’t COMPLETELY unproductive. I was lucky enough to be able to get some time at work to create a piece of whatever I wanted as long as I used our computer software. I’m more confident in my painting skills, but I had never made a digital painting before! That’s a whole different set of rules than I’m used to, but I understand the basics. In some ways it’s almost better than using real paint! You can’t ctrl+z standing at an easel or magically have an endless supply of the perfect paint color you mixed. I was particularly proud of this piece, so I thought that I should share it. and used it as a reference for this piece. 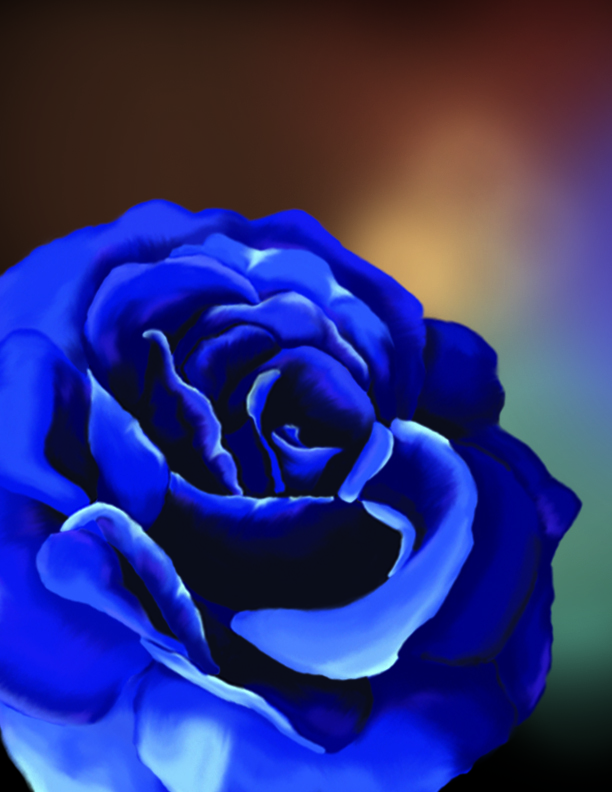 I worked in multiple photoshop layers to build up each “round” of petals in the flower. I created my own color palette to choose from, using a range of a few purples and blues. For the background, I started off with a layer of flat black. Then I used HUGE, really soft brushes (I think around 200 – 300pt) to lightly pat in colors of my choosing. I say “pat” because the brush strokes looked so soft on-screen that it looked like I was literally patting in powder, haha. Thanks so much Stephanie! I'm very happy it has your approval then, haha. OMG Traci, this looks BEAUTIFUL! It's almost like I can reach into my computer and pull it out! I wouldn’t mind publishing a post or elaborating on a few of the subjects you write about here. Again, awesome weblog! Hi Stephania! It warms my heart to hear that you and your spouse enjoy the blog. Thank you so much for sharing! I would love to hear what you have to say as a guest writer. Please email me at tturner@apurplepaintbrush.com and we can set something up!